Color reproducibility of a proof print agrees with color reproducibility of a print generated at a laboratory. Image data obtained by a user with a digital camera are printed by a printer to generate a proof print. The proof print is read by reading means in a laboratory and scanned image data are obtained. The scanned image data are converted into a Lab color space by first conversion means, and converted scanned image data are generated. A relationship between data values of original image data and the converted scanned image data is calculated as a look-up table by calculation means. Second conversion means converts the original image data based on the look-up table, and obtains converted original image data. Third conversion means converts the converted original image data into print image data, and printing means generates a print by printing the print image data. FIG. 14 is a flow chart showing operation of the fourth embodiment. FIG. 1 is a block diagram showing a configuration of an image output system adopting an image correction apparatus as a first embodiment of the present invention. As shown in FIG. 1, the image output system in this embodiment exchanges data and a print between a user  1 and a laboratory 2. The user 1 obtains original image data S0 by using a digital camera (DSC) 11, and generates processed original image data S1 by carrying out various kinds of image processing on the original image data S0 by using a personal computer 12. The user 1 obtains a proof print TP having desired colors by using a household printer 13 such as an ink jet printer. The original image data S0 may be obtained by reading an original image such as a photographic film with a scanner. In this embodiment, the original image data S0 comprise R0, G0, and B0 color data while the processed original image data S1 comprise R1, G1, and B1 color data. The user 1 may record the processed original image data S1 in a recording medium such as an FD to provide the medium to the laboratory 2. Alternatively, the original image data S1 may be provided to the laboratory 2 via a network. The user 1 brings or mails the proof print TP to the laboratory 2. The laboratory  2 comprises reading means 21 such as a scanner for obtaining scanned image data S2 (R2, G2, B2) representing an image of the proof print TP by photoelectrically reading the proof print TP, first conversion means 22 for obtaining converted scanned image data S2′ (L2, a2, b2) by converting the scanned image data S2 into a common color space (the CIE1976Lab color space in this embodiment) corresponding to color perception with reference to a three-dimensional look-up table LUT1 (hereinafter simply called LUT1), calculation means 23 for calculating a relationship between data values of the processed original image data S1 and the converted scanned image data S2′ as a three-dimensional look-up table LUT2 (hereinafter simply called LUT2), second conversion means 24 for obtaining converted original image data S1, by converting the original image data S1 into the Lab color space according to LUT2, third conversion means 25 for obtaining print image data S3 (R3, G3, B3) by converting the converted original image data S1′ into a printing color space by referring to a three-dimensional look-up table LUT3 (hereinafter simply called LUT3), and printing means 26 for obtaining a print P1 by printing the print image data S3. In this embodiment, the CIE1976Lab color space is used as the common color space. However, the CIE1976Luv color space may be used instead of the CIE1976Lab color space. Furthermore, the CIE1931XYZ color space may also be used provided that the same light source is used for observing the proof print TP and the print P 1. The first conversion means  22 divides a scanned image represented by the scanned image data S2 into areas each comprising n×n (4×4, for example) pixels as shown in FIG. 2, and finds an average of pixel values in each area. The first conversion means 22 then converts the scanned image into a mosaic-like image by using the average in each area as the pixel value in the area. The first conversion means 22 obtains the converted scanned image data S2′ (L2, a2, b2) by converting the scanned image data S2 (R2, G2, B2) of the mosaic-like image into the Lab color space according to LUT1. In this manner, the data values L2, a2, and b2 are obtained for each of the areas having the n×n pixels in the converted scanned image data S2′. LUT 1 is found in the following manner. First, the printer 13 prints a color chart having a plurality of color patches. Each patch is subjected to colorimetry and colorimetric values in the Lab color space are found. The color chart is read by the reading means 21. A relationship between RGB data of the color patches obtained by reading and the colorimetric values in the Lab color space is found as a three-dimensional look-up table, which is used as LUT1. The calculation means  23 calculates LUT2 in the following manner. First, an original image represented by the original image data S1 are divided into areas of n×n (such as 4×4) pixels each as in the case of the scanned image of the proof print TP, and an average of each area is found. The areas correspond to the areas having the n×n pixels each in the converted scanned image data S2′. The original image is then converted into a mosaic-like image having the average as a pixel value of each area. A relationship is found between the data values R1, G1, and B1 in each area of n×n pixels in the original image and the data values L2, a2, and b2 in each corresponding area of the n×n pixels in a converted scanned image represented by the converted scanned image data S2′. Here, the matrix M 1 is a 3×4 matrix. Therefore, the matrix M1 is found by finding coefficients of the matrix M1 according to the least square method by using Equation (3) for each of the areas of n×n pixels. Using the matrix M1 and Equation (2), the relationship between the data values R1, G1, and B1 and the data values L2, a2, and b2 is found for all colors as a three-dimensional look-up table, and used as LUT2. Here, M 2 is a 3×10 matrix and M3 is a 3×20 matrix. In this case, the matrices M 2 and M3 are found by calculating elements of the matrices according to the least square method using the relationships represented by Equations (4) and (5) for all the n×n pixel areas. 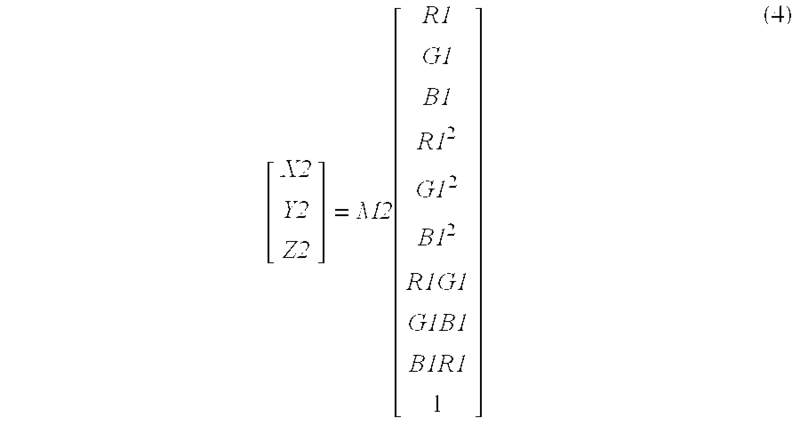 The relationship between the data values R1, G1, and B1 and the data values L2, a2, and b2 is found for all colors by using Equation (2) and the matrices M2 and M3, and can be used as LUT2. In order to find LUT 2, if the relationship between the data values of the converted scanned image represented by the converted scanned image data S2′ and the data values of the original image is found for each corresponding pixel, the number of required operations therefor becomes large. Furthermore, since the converted scanned image data S2′ are obtained by converting the scanned image data S2 obtained by photoelectrically reading the proof print TP, the scanned image itself is blurry due to defocus and flare of an optical system of the reading means 21. As a result, accurate position matching of the converted scanned image with the original image is difficult. Therefore, by finding the average of each area of n×n pixels in the original image and in the converted scanned image and by relating the average of each area in the original image to the average of the corresponding area in the converted scanned image to find LUT 2, accurate position matching between the original image and the converted scanned image is not necessary. Furthermore, the amount of operation can be reduced compared to the case of calculating LUT2 by using the original image and the converted scanned image as they are. The second conversion means  24 converts the original image data S1 (R1, G1, B1) into the Lab color space and obtains the converted original image data S1′ (L1, a1, b1). The third conversion means  25 obtains the print image data S3 (R3, G3, B3) by converting the converted original image data S1′ into the printing color space according to LUT3. LUT3 is found in the following manner. The same color chart as the color chart used for finding LUT1 is printed by the printing means 26. The color chart is subjected to colorimetry and a relationship between RGB data values and calorimetric values in the Lab color space is found as a three-dimensional look-up table to be used as LUT3. operation of the first embodiment will be explained next. FIG. 3 is a flow chart showing the operation of the first embodiment. The reading means 21 reads the proof print TP and obtains the scanned image data S2 (Step S1). The first conversion means 22 divides the scanned image data S2 into the n×n pixels and finds the average of the pixel values in each area. The average is converted into the Lab color space by using LUT1, and the converted scanned image data S2′ are obtained (Step S2). The converted scanned image data S2′ are input to the calculation means 23 and LUT2 is calculated from the relationship between the data values of the original image data S1 and the data values of the converted scanned image data S2′ (Step S3). LUT 2 is input to the second conversion means 24 and the second conversion means 24 obtains the converted original image data S1′ by converting the original image data S1 into the Lab color space by using LUT2 (Step S4). The converted original image data S1, are input to the third conversion means 25 and the third conversion means 25 obtains the print image data S3 by converting the converted original image data S1′ into the printing color space by referring to LUT3 (Step S5). The printing means 26 outputs the print image data S3 as the print P1 (Step S6) to end the procedure. As has been described above, in the first embodiment, the converted scanned image data S 2′ are obtained by converting the scanned image data S2 into the Lab color space as the common color space corresponding to color perception, and the relationship between the converted scanned image data S2′ and the original image data S1 is found as LUT2. The converted original image data S1′ are then obtained by converting the original image data S1 into the Lab color space according to LUT2, and the print image data S3 are obtained by converting the converted original image data S1′ from the Lab color space into the printing color space. By converting the original image data S 1 into the Lab color space, the data values of the converted original image data S1′ correspond to the data values of the converted scanned image data S2′. Therefore, by converting the original image data S1 with reference to LUT2, colors of the proof print TP correspond to colors of the original image one to one. Meanwhile, by converting the converted original image data S1′ into the printing color space, the data values of the print image data S3 correspond to the data values of the converted original image data S1′. Therefore, the colors of the original image and colors of the print P1 have one-to-one correspondence. As a result, the colors of the proof print TP and the colors of the print P1 correspond one to one. Consequently, color reproducibility of the print P1 agrees with color reproducibility of the proof print TP even when the printer 13 for obtaining the proof print TP has a color processing method or a coloring characteristic and/or recording method different from those of the printing means 26 for generating the print P1. As a result, the print P1 having the same color reproducibility as the proof print TP can be generated. In the above embodiment, the calculation means  23 finds the relationship between the original image data S1 and the converted scanned image data S2′ as the three-dimensional look-up table. However, the matrices M1˜M3 in Equations (3) to (5) may be found and input to the second conversion means 24 so that the second conversion means 24 can convert the original image data S1 into the Lab color space by carrying out operations described by Equations (3) to (5) using the matrices M1˜M3. In the above embodiment, agreement between the color reproducibility of the proof print TP generated by the household color printer  13 and the color reproducibility of the print P1 generated by the printing means 26 in the laboratory is sought. However, the use 1 may own the same printing means as the printing means 26 in some cases. In such a case, when the same original image data S1 are printed, prints having the same color reproducibility should be obtained by the two printing means. However, due to a difference in a printing condition of the respective printing means, the prints obtained by using the two printing means cannot have the same color reproducibility in some cases. In such a case, the print obtained by the printing means of the user 1 is used as the proof print TP in the first embodiment. By carrying out the reading of the proof print TP, the generation of LUT2, the conversion of the original image data S1 and printing by the printing means 26 as in the first embodiment, the color reproducibility of the print P1 generated by the printing means 26 can be the same as the color reproducibility of the print obtained by the printing means of the user 1. A second embodiment of the present invention will be explained next. FIG. 4 is a block diagram showing a configuration of an image output system adopting an image correction apparatus as the second embodiment of the present invention. In the second embodiment, the same reference numerals are used for the same elements as in the first embodiment, and detailed explanation thereof is omitted. In the second embodiment, a user  1 requests from a laboratory 2 reading and printing of a film F0 on which images have been recorded by photographing, and requests from the laboratory 2 additional printing of a desired print P0 after receiving prints Ps generated by the previous printing. Therefore, the laboratory 2 comprises film reading means 31 for obtaining original image data S0 by reading the images recorded on the film F0, image processing means 32 for carrying out various kinds of image processing on the original image data S0 and for obtaining processed original image data S1, an image database 33 for storing the original image data S1, and reading means 34 for reading order information C0 generated by the user 1 as will be explained later and for issuing an instruction R0 for outputting the original image data S1 to the image database 33 based on the content of an order described in the order information C0. The film F0 is assumed to have been developed. The original image data obtained by the film reading means 31 in the second embodiment correspond to the original image data S0 obtained by the digital camera 11 in the first embodiment. The processed original image data obtained by the image processing means 32 correspond to the processed original image data S1 generated by the personal computer 12 in the first embodiment. Therefore, the same reference numerals are used. Operation of the second embodiment will be explained next. FIG. 5 is a flow chart showing the operation of the second embodiment. As shown in FIG. 5, the film F 0 whose printing has been requested by the user 1 is read by the film reading means 31 in the laboratory 2 and the original image data S0 are obtained (Step S11). The image processing means 32 carries out the image processing on the original image data S0, and the processed image data S1 are obtained (Step S12). The processed original image data S1 are stored in the database 33 (Step S13). Meanwhile, the original image data S1 are input to printing means 26 and the prints Ps corresponding to frames of the film F0 are printed (Step S14). The prints Ps are then provided to the user 1 (Step S15). At this time, file names of the prints Ps are printed on paper or the like and provided to the user 1. Alternatively, a text file describing the file names therein may be recorded in a recording medium such as an FD and provided to the user 1. The user  1 selects the print P0 for additional printing from the prints Ps, and generates the order information C0 for requesting the additional printing of the print P0, by using a personal computer 12. FIG. 6 shows the content of the order described in the order information C0. As shown in FIG. 6, the order information C0 describes preference of a white margin of the print and glossy or non-glossy photosensitive material, in addition to the file name of the print to be printed additionally and the quantity of prints, for example. The personal computer 12 is connected to the laboratory 2 via a network. The user 1 transfers the order information C0 to the laboratory 2 via the network (Step S16) and mails the print P0 to the laboratory 2. The order information C0 may be mailed to the laboratory 2 together with the print P0, by being recorded in a recording medium such as an FD. The reading means  34 of the laboratory 2 reads the order information C0 and inputs the output instruction R0 to the image database 33 for reading the original image data S1 having the file name corresponding to the order content (Step S17). The image database 33 inputs the original image data S1 to calculation means 23 and second conversion means 24 (Step S18). Meanwhile, the print P0 is delivered to the laboratory 2, and reading means 21 reads the print P0 to obtain scanned image data S2 (Step S19). First conversion means 22 converts the scanned image data S2 into the Lab color space by referring to LUT1 and converted scanned image data S2′ are obtained (Step S20). The converted scanned image data S2′ are input to the calculation means 23 and LUT2 is generated as a relationship between data values of the original image data S1 and the converted scanned image data S2′ (Step S21). LUT 2 is input to the second conversion means 24 and the original image data S1 are converted into the Lab color space by using LUT2 to generate converted original image data S1′ (Step S22). The converted original image data S1′ are input to third conversion means 25 and converted into a printing color space with reference to LUT3, to generate print image data S3 (Step S23). The printing means 26 outputs the print image data S3 as a print P1 (Step S24) to end the procedure. As has been described above, in the second embodiment, the print P 1 having the same color reproducibility as the print P0 can be obtained at the time of additional printing, even if the printing condition is not the same as at the time of generating the print P0. In the second embodiment, the print P 0 is selected from the prints Ps generated by the laboratory 2. However, a print P0′ for additional printing may be selected from prints Ps′ generated by a laboratory other than the laboratory 2, and only additional printing maybe requested from the laboratory 2. In this case, original image data S1 are not stored in the laboratory 2. Therefore, the user 1 may provide the original image data S1 to the laboratory 2. Alternatively, the laboratory 2 may be connected to the laboratory that generated the prints Ps′ via a network and the original image data S1 are read by the laboratory 2 by accessing an image database of the laboratory that generated P0′. In this manner, a print P1′ having the same color reproducibility as the print P0′ can be generated, as in the second embodiment. A third embodiment of the present invention will be explained next. FIG. 7 is a block diagram showing a configuration of an image output system adopting an image correction apparatus as the third embodiment of the present invention. In the third embodiment, the same elements as in the first embodiment have the same reference numerals and detailed explanation thereof is omitted. In the third embodiment, a user  1 secretly embeds ID information H in original image data S0 obtained by using a digital camera 11, and original image data S4 having the ID information H embedded therein are obtained. The original image data S4 are subjected to the same processing carried out on the original image data S1 in the first embodiment. Therefore, the user 1 has embedding means 15 for secretly embeding the ID information H in the original image data S0, and a laboratory 2 has extraction means 37 for extracting the ID information H from scanned image data S6 (R6, G6, B6) obtained by reading a proof print TP by using reading means 21 thereof and for issuing an instruction R1 to an image server 3 to output original image data S5 corresponding to the ID information H. The original image data S4 having the ID information H embedded therein are subjected to the image processing as in the first embodiment by a personal computer 12 and the original image data S5 (R5, G5, B5) after the image processing are obtained. The proof print TP is generated by printing the original image data S5 by using a printer 13. The original image data S5 are stored in relation to the ID information H in the image server 3 connected to the personal computer 12 of the user 1 and to the laboratory 2 via a network. In the third embodiment, the image data obtained by the reading means  21 and first conversion means 22 are called the scanned image data S6 (R6, G6, B6) and converted scanned image data S6′ (L6, a6, b6), respectively. Image data obtained by second conversion means 24 through conversion of the original image data S5 are called converted original image data S5′ (L5, a5, b5) and image data obtained by third conversion means 25 are called print image data S7 (R7, G7, B7). The embedding means  15 secretly embeds the ID information H in the original picture data S0, and obtains the original image data S4 having the ID information H embedded therein. Hereinafter, how the ID information H is embedded by the embedding means 15 will be explained. An original image (hereinafter called S0) represented by the original image data S0 is an image comprising m×n pixels of 8-bit RGB data. First, subplanes SB each comprising p×q pixels (p<m, q<n) are generated at several-pixel intervals from the original image S0. The number of the subplanes SB in the original image S0 may be one as shown in FIG. 8A, or larger than one as shown in FIG. 8B. In this embodiment, seven subplanes SB are used as shown in FIG. 8B. 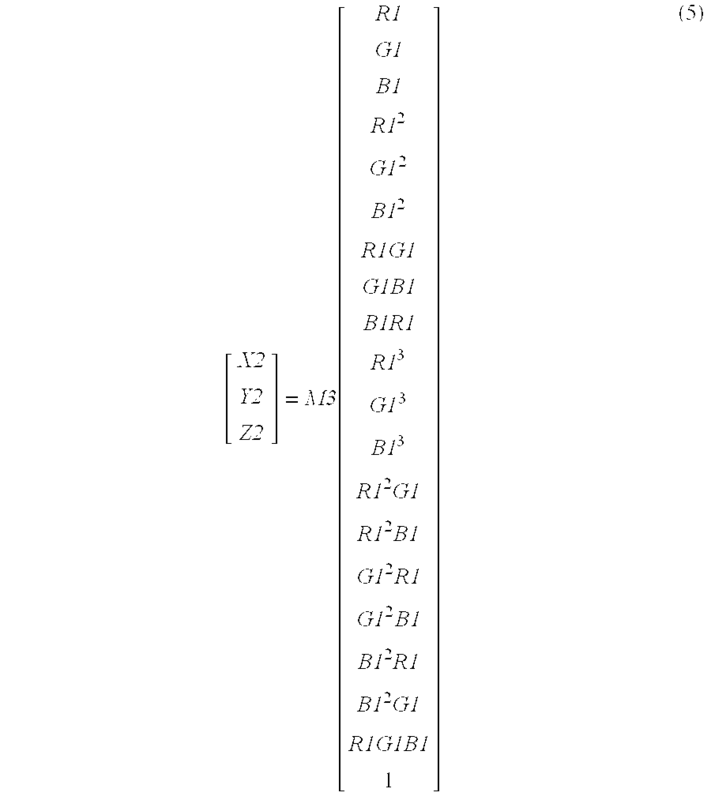 Eight bits comprising three lower bits of each of the R channel and B channel and two lower bits of the G channel are used as a bit plane of the ID information H to be embedded. If the ID information H is described in 16 bits, 7 bits each are assigned to the R and B channels while 2 bits are assigned to the G channel. The number of bits assigned to the G channel is smaller than the number of bits assigned to the R channel or the B channel, since human eyes are most sensitive to the G channel. First, how the information is embedded in the R channel will be explained. Since the 7-bit information is embedded in the R channel, seven types of modulation patterns are prepared for an area of p×q pixels which has the same size as the subplanes SB. For example, as shown in FIG. 9, each of the subplanes SB is divided into 8 areas, and 7 types of modulation patterns A˜G modulated in a period of 2 p/k (k=1, 2, 3, 4) in an x direction and 2 q/l (l=1, 2) in a y direction are used for the areas. The case of k=l=1 is not used as the modulation pattern. If each of the subplanes SB is divided into  8 areas as shown in FIG. 9, the information can be embedded in each of the areas, which will be explained later, as long as each of the areas has one pixel. Therefore, the subplanes SB having at least 4×2 pixels each are sufficient. By embedding the 16-bit ID information H in the RGB channels of the original image data S 0 as has been described above, the original image data S4 having the ID information H can be obtained. Since the ID information H is embedded dispersedly in the lower 3 bits and the lower 2 bits of the RGB channels, the ID information can hardly be perceived by human eyes even when the original picture data S4 are reproduced. The personal computer  12 may have the same function as the embedding means 15, or the ID information H may be embedded after the image processing is carried out by the personal computer 12. The original image data S 5 after the image processing by the personal computer 12 are stored in the image server 3. At this time, the original image data S5 are stored by being related to the ID information H.
The extraction means  37 of the laboratory 2 extracts the ID information H from the scanned image data S6 (R6, G6, B6) obtained by reading the proof print TP by using the reading means 21. More specifically, the bit plane of the lower 3 bits of each of the R and B channels and the lower 2 bits of the G channel is extracted. The modulation patterns of the subplanes SB in the bit plane and the modulation patterns shown in FIGS. 9 and 10 are subjected to pattern matching, and correlation therebetween is found. By the pattern matching, which of the modulation patterns are embedded is detected, and the 16-bit information can be extracted as the ID information H. The extraction means 37 inputs the instruction R1 to the image server 3 to output the original image data S5 corresponding to the ID information H.
Operation of the third embodiment will be explained next. FIG. 11 is a flow chart showing the operation of the third embodiment until the proof print TP is printed. The original image data S 0 obtained by the user 1 with the digital camera 11 are input to the embedding means 15 (Step S31), and the ID information H is embedded. The original image data S4 having the ID information embedded therein are obtained (Step S32). The original image data S4 are subjected to the image processing by the personal computer 12, and the processed original image data S5 are obtained (Step S33). The original image data S5 are stored in the image server 3 by being related to the ID information H (Step S34). Meanwhile, the original image data S5 are input to the printer 13 and the proof print TP is generated (Step S35). The above is the procedure until the proof print TP is generated. FIG. 12 is a flow chart showing operation of the laboratory  2 in the third embodiment. The reading means 21 reads the proof print TP and the scanned image data S6 are obtained (Step S41). The scanned image data S6 are input to the extraction means 37 and the ID information H is extracted, as has been described above (Step S42). The extraction means 37 issues the instruction R1 to the image server 3 to output the original image data S5 corresponding to the ID information H (Step S43). The image server 3 reads the original image data S5 based on the instruction R1 and transfers the original image data S5 to the laboratory 2. The original image data S5 are then input to calculation means 23 and the second conversion means 24 of the laboratory 2 (step S44). Meanwhile, the first conversion means  22 converts the scanned image data S6 into the Lab color space by referring to LUT1 and the converted scanned image data S6′ are obtained (Step S45). The converted scanned image data S6′ are input to the calculation means 23, and LUT2 is calculated as a relationship between data values of the original image data S5 and the converted scanned image data S6′ (Step S46). LUT 2 is input to the second conversion means 24 and the original image data S5 are converted into the Lab color space with reference to LUT2. The converted original image data S5′ are obtained (Step S47). The converted original image data S5′ are input to the third conversion means 25, and converted into a printing color space by referring to LUT3. In this manner, the print image data S7 are obtained (Step S48). Printing means 26 outputs the print image data S7 as a print P1 (Step S49) to end the procedure. As has been described above, in the third embodiment, the print P 1 having the same color reproducibility as the proof print TP can be obtained. Since the original image data S 5 has the ID information H embedded therein, the proof print TP has the ID information H. Therefore, the user 1 can obtain the print P1 having the same color reproducibility as the proof print TP through extraction of the ID information H from the scanned image data S6, if the user 1 simply provides the proof print TP to the laboratory 2. Therefore, the user 1 does not need to provide information for specifying the original image data S5 to the laboratory 2, which is convenient for the user 1. In the third embodiment, the embedding means  15 secretly embeds the ID information H in the original image data S0. Therefore, the ID information H can be embedded in the original image data S0 without being known. In the third embodiment, the  7-bit information is embedded by using the modulation patterns shown in FIGS. 9 and 10. However, by dividing the area of p×q pixels in the subplane SB into seven areas and by generating modulation patterns of ON (=1) and OFF (=0) for the areas, the 7-bit information can also be embedded in the subplane SB. In this case, if the number of the areas being ON is used as the pixel value of the areas, the pixel value can range from 0 to 7. Therefore, the information can be embedded in the lower 3 bits of R and B as in the third embodiment. In this case, by using a plurality of the subplanes SB in an original image S 5 represented by the original image data S5, the original image data S5 can be read from the image server 3 if at least one of the subplanes SB exists even in the case where the proof print TP is partially damaged, for example. In the third embodiment, the ID information H is secretly embedded in the original image data S 0. However, the ID information H may be printed on the back of the proof print TP by using a bar code or characters. In the case where the proof print has a white margin, the ID information H can be printed on the margin. In this case, the reading means 21 reads the ID information H recorded on the proof print TP and inputs the information to the extraction means 37. The extraction means 37 inputs the instruction R1 to the image server 3 based on the ID information H input thereto. In the third embodiment, agreement between the color reproducibility of the proof print TP generated by the household color printer  13 and the color reproducibility of the print P1 generated by the printing means 26 in the laboratory 2 is sought. However, the user 1 may have the same printing means as the printing means 26 in some cases. In such a case, when the same original image data S4 are printed, prints having the same color reproducibility should be obtained by the two printing means. However, due to a difference in a printing condition of the two printing means, the prints obtained by using the two printing means may not have the same color reproducibility in some cases. In such a case, the print obtained by the printing means of the user 1 is used as the proof print TP in the third embodiment. By carrying out the reading of the proof print TP, extraction of the Information H, the generation of LUT2, the conversion of the original image data S5 and printing by the printing means 26 as in the third embodiment, the color reproducibility of the print P1 generated by the printing means 26 can be made the same as the color reproducibility of the print obtained by the printing means of the user 1. A fourth embodiment of the present invention will be explained next. FIG. 13 is a block diagram showing a configuration of an image output system adopting an image correction apparatus as the fourth embodiment of the present invention. In the fourth embodiment, the same elements as in the first to third embodiments have the same reference numerals and detailed explanation thereof is omitted. In the fourth embodiment, a user  1 requests from a laboratory 2 reading and printing of a film F0 recording images obtained by photographing, and selects a desired print P0 from prints Ps to request additional printing from the laboratory 2, as in the second embodiment. In the laboratory 2, ID information H is embedded in original image data S0 obtained by film reading means 31, and original image data S5 having the ID information H embedded therein and having been subjected to image processing are stored in an image database 33 in relation to the ID information H.
Therefore, the laboratory  2 comprises embedding means 39 for secretly embedding the ID information H in the original image data S0 obtained by the film reading means 31 and extraction means 37 for extracting the ID information H from scanned image data S6 obtained by reading the print P0 by reading means 21 and for issuing an output instruction R2 to the image database 33 to output the original image data S5 corresponding to the ID information H, in addition to the film reading means 31, image processing means 32, and the image database 33. In the fourth embodiment, the reference numerals added to the image data correspond to the reference numerals in the third embodiment. In other words, the image data having the ID information H embedded by the embedding means  39 are image data S4, and image data having been subjected to the image processing by the image processing means 32 are the image data S5. Image data obtained by the reading means 21 are the scanned image data S6 (R6, G6, B6), and image data obtained by first conversion means 22 are image data S6′(L6, a6, b6). Image data obtained by second conversion means 24 after conversion of the original image data S5 are converted original image data S5′ (L5, a5, b5), and image data obtained by third conversion means 25 are print image data S7 (R7, G7, B7). The output instruction from the extraction means 37 is called R2. Processing to embed the ID information H in the original image data S 0 by using the embedding means 39 is the same processing carried out by the embedding means 15 in the third embodiment. Therefore, detailed explanation thereof is omitted. Operation of the fourth embodiment will be explained next. FIG. 14 is a flow chart showing the operation of the fourth embodiment. As shown in FIG. 14, in the laboratory  2, the film F0 whose printing has been requested by the user 1 is read by the film reading means 31 and the original image data S0 are obtained (Step S51). The embedding means 39 embeds the ID information H in the original image data S0 and the original image data S4 having the ID information H embedded therein are obtained (Step S52). The image processing means 32 carries out the image processing on the original image data S4 and the processed original image data S5 are obtained (Step S53). The original image data S5 are stored in the image database 33 by being related to the ID information H (Step S54). Meanwhile, the original image data S5 are input to printing means 26 and the prints Ps corresponding to frames in the film F0 are output (Step S55). The prints Ps are provided to the user 1 (Step S56). The user  1 selects the print P0 for additional printing from the prints Ps, and generates order information C1 for requesting additional printing of the print P0 by using a personal computer 12. In the fourth embodiment, the order information C1 is generated by printing the content of the order and attached to the selected print P0. In this manner, the print P0 and the order information C1 are provided to the laboratory 2. The content of the order in the fourth embodiment is the same as the order content shown in FIG. 6, except for the file name omitted in the order information C1. The user  1 provides the print P0 and the order information c1 attached thereto to the laboratory 2 by mailing or the like (Step S57). In the laboratory 2, the reading means 21 reads the print P0 and the scanned image data S6 are obtained (Step S58). The scanned image data S6 are input to the extraction means 37, and the ID information H is extracted as has been described above (Step S59). The extraction means 37 issues the output instruction R2 to the image database 33 for outputting the original image data S5 corresponding to the ID information H (Step S60). The image database 33 reads the original image data S5 based on the instruction R2 and transfers the data to the laboratory 2. The original image data S5 are input to calculation means 23 and the second conversion means 24 of the laboratory 2 (Step S61). Meanwhile, the scanned image data S 6 are converted into the Lab color space by the first conversion means 22 referring to LUT1, and the converted scanned image data S6′ are obtained (Step S62). The converted scanned image data S6′ are input to the calculation means 23 and LUT2 is calculated as a relationship between data values of the original image data S5 and the converted scanned image data S6′ (Step S63). LUT 2 is input to the second conversion means 24 and the original image data S5 are converted into the Lab color space according to LUT2. In this manner, the converted original image data S5′ are obtained (Step S64). The converted original image data S5′ are input to the third conversion means 25 and converted into a printing color space according to LUT3. In this manner, the print image data S7 are obtained (Step S65). Meanwhile, the content of the order information C1 is input to the printing means 26. The printing means 26 outputs the print image data S7 as a print P1 based on the order information C1 (Step S66) to end the procedure. As has been described above, the print P 1 having the same color reproducibility as the print P0 can be obtained in the fourth embodiment, as in the first embodiment. Since the original image data S 5 has the ID information H embedded therein, the prints Ps have the ID information H embedded therein. Therefore, the print P1 having the same color reproducibility as the selected print P0 can be obtained by extracting the ID information H from the scanned image data S6, if the user 1 simply provides the print P0 to the laboratory 2. Therefore, the user 1 does not need to provide information for specifying the original image data S5 to the laboratory 2, which improves convenience for the user 1. In the fourth embodiment, the ID information H can be added to the original image S 0 without being known to others, since the embedding means 39 secretly embeds the ID information H into the original image S0. In the fourth embodiment, the ID information H is secretly embedded in the original image data S 0. However, the ID information H may be recorded on the prints Ps by using a bar code or characters on the back thereof. Alternatively, in the case where the prints Ps have a white margin, the ID information H may be printed on the white margin. In this case, the reading means 21 reads the ID information H recorded on the print P0 and input the information to the extraction means 37. The extraction means 37 outputs the instruction R2 to the image database 33 based on the ID information H.
obtaining a print based on the print image data. calculating, as the color correspondence relationship, a relationship between data values of a converted scanned image represented by the converted scanned image data and a sampled original image represented by the sampled original image data, at positions corresponding to each other in the sampled original image and in the converted scanned image. 3. An image correction method as defined in claim 1 or 2, wherein the color correspondence relationship is calculated as a look-up table. calculating, as the color correspondence relationship, a relationship between data values of a converted scanned image represented by the converted scanned image data and a sampled original image represented by the sampled equivalent original image data, at positions corresponding to each other in the sampled original image and in the converted scanned image. 6. An image correction method as defined in claim 4 or 5, wherein the color correspondence relationship is calculated as a look-up table. printing means for obtaining a print based on the print image data. the calculation means averages and samples the original image data in each of the areas having the predetermined range, and calculates the color correspondence relationship as a relationship between data values of a converted scanned image represented by the converted scanned image data and a sampled original image represented by the sampled original image data, at positions corresponding to each other in the sampled original image and in the converted scanned image. 9. An image correction apparatus as defined in claim 7 or 8, wherein the calculation means calculates the color correspondence relationship as a look-up table. the calculation means averages and samples the equivalent original image data in each of the areas having the predetermined range, and calculates the color correspondence relationship as a relationship between data values of a converted scanned image represented by the converted scanned image data and a sampled original image represented by the sampled original image data, at positions corresponding to each other in the sampled original image and in the converted scanned image. 12. An image correction apparatus as defined in claim 10 or 11, wherein the calculation means calculates the color correspondence relationship as a look-up table. 15. A computer-readable recording medium as defined in claim 13 or 14, the procedure of calculating being the procedure of calculating the color correspondence relationship as a look-up table. 18. A computer-readable recording medium as defined in claim 16 or 17, the procedure of calculating being the procedure of calculating the color correspondence relationship as a look-up table.